Pino Luongo’s love of food began in his mother’s kitchen in Florence. At the age of sixteen, he developed culinary skills in the summers working at his uncle’s restaurant in Porto Santo Stefano, Tuscany. 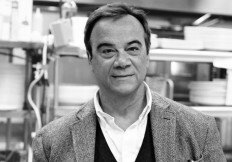 Although trained in acting, Luongo followed his true passion of pursuing a career as a chef & restaurateur when he moved to New York City from Florence in 1980. In 1983, Luongo opened Il Cantinori, an instant hit in NYC’s East Village. With each additional restaurant, sixteen at one time, he transferred the essence of his homeland — the flavors, the landscape, the history and the culture of Italy to America. In 1988 he introduced regional Italian cuisine with Sapore di Mare (Taste of the Sea) in East Hampton and in 1989, Le Madri (The Mothers), for which he flew in Italian mothers to ensure authenticity of the Tuscan kitchen. Luongo opened Coco Pazzo (The Crazy Chef) in 1990 in Manhattan’s Upper East Side. As the name suggests, Coco Pazzo introduced sophistication and wit to traditional Tuscan fare. Diners soon became regulars, as Coco Pazzo’s clientele of luminaries from the financial world and entertainment industries responded to Luongo’s flare in his dishes, warm atmosphere, and the gracious service. The appeal of Coco Pazzo and Luongo’s reputation as restaurateur led to additional locations of Coco Pazzo in New York and Chicago. Luongo developed and opened each location. In NYC, these included Coco Marina, formerly in the World Financial Center and Coco Pazzo Teatro, formerly in Times Square and in Chicago, Coco Pazzo and Coco Pazzo Café. Luongo opened Centolire in March 2001. Italian for “100 lire,” Centolire is the name of an old song that begins, “with 100 lire you can go to America.” Decorated with antique tools used by early Italian American immigrants and elegant Brunschwig et Fils fabrics, Centolire featured old and new world Italian American cuisine: Spaghetti alla Chitarra with Meatballs, Peas and Mushrooms; Classic Caesar Salad Prepared Tableside; Mezze Maniche with Cauliflower Confit and La Grande, a Grilled T-Bone Steak with choice of accompaniments. Opened in October 2011 and described as the culmination of his 30 years in food and passion for culinary excellence, Morso reflects Luongo’s devotion to the essence of his Tuscan homeland – great seasonal ingredients, skillfully prepared and shared with family and friends. Taking little bites of inspiration from all over Italy and the Mediterranean combined with Luongo’s finest signature dishes and served in morso (smaller) servings or tutto (full size); Morso represents a quintessential dining experience—authentic contemporary cooking in a vibrant and relaxed setting. Luongo is a best-selling author, memoirist and an authority on Tuscan food and cooking. His books include ATuscan in the Kitchen, published by Crown in 1988 with sales exceeding fifty thousand copies. Fish Talking, published by Crown in1994, shares his love of seafood that he indulged in his Hamptons restaurant, Sapore di Mare. SimplyTuscan, published by Broadway Books in 2000, with sales exceeding eighty thousand copies, and La Mia Cucina Toscana, published by Broadway Books in 2003, share his respect for classic recipes in a coffee table format offered to the reader as “Il Classico, and his own version, “La Mia Versione” that incorporates Luongo’s life and experience in New York and the restaurant business. In Two Meatballs in the Italian Kitchen, published in fall 2007, Luongo collaborates with his buddy and business partner Mark Straussman to write about the simple Italian food they love, along with decades of experience, sage advice, and wonderful recipes. Dirty Dishes, published in 2008 with foreword by Anthony Bourdain, is Luongo’s memoir. Billed as “A Story of Passion, Pain and Pasta,” the book relates Luongo’s journey from his childhood in Tuscany to his life in America as a restaurateur. Shop books here. Dubbed a “charismatic impresario,” Luongo is a media personality. He was an actor in Rome and has used his talents well as a frequent Talk Show guest, appearing on Good Morning America, Regis & Cathy, Today Show, and Martha Stewart Living. A selection of these appearances is available on tape. Luongo returns to Tuscany several times a year with his wife and three children to reconnect with Family and Friends. In addition to the time he spends in the kitchen cooking and testing recipes, Luongo enjoys soccer, squash, opera and Italian pop music. The Luongos reside in Westchester, New York.